Ipalogama which has always contributed to the country’s economy with its agricultural and farming industries is now increasingly moving towards more commercially viable cultivations utilising better farming tech techniques. In this backdrop Pan Asia Bank identified the need to assist the enterprising farmers of Ipalogama when its Development Banking Division officials visited the area to provide small scale entrepreneurs with financial assistance to expand their businesses. “Impressed by both the village’s agriculture friendly climate and the determination of its youth who were determined to make their agricultural endeavours a commercial success, we decided to help them out by selecting several families to begin guava cultivation in the area. With the financial assistance and coordination of our Kekirawa branch, we were able to offer start-up guava farmers viable refinancing plans (with interest as low as 5.5%) under the Central Bank ‘Swashakthi’ Loan Scheme during the first half of 2017. Under the careful supervision of our Kekirawa branch, guava cultivation increased in leaps and bounds to exceed over 75 acres in the area,” said Pan Asia Bank Assistant Manager – Development Banking Ranjith Athukorala. The bank’s involvement and commitment to assist the farmers of Ipalogama did not stop there as they realised that in order to reap the full benefits of their efforts; farmers of Ipalogama had to be introduced to better agricultural technologies. Hence, Pan Asia Bank decided to help them increase their harvest and substantially reduce cultivation costs by joining hands with the Global Climate Partnership Fund (GCPF), which is an investment fund dedicated to energy conservation and sustainable environment management. With this collaboration, the bank began introducing guava cultivation to farmers in Ipalogama for export purposes. “During our initial research conducted it was revealed that over 75% of guava farmers used inefficient irrigation methods that wasted both water and energy; while a further 20% provided their plantations with insufficient water due to ignorance. Based on these factors, we decided to first educate guava farmers on the benefits of Drip Irrigation and then, as the second stage, help them set-up drip irrigation systems on their plantations. We also organised a technical workshop including a field visit, sponsored by Bartleet Agrotronics that enabled farmers to benefit from the specialised knowledge and expertise of Drip Irrigation Systems in India” commented Athukorala. 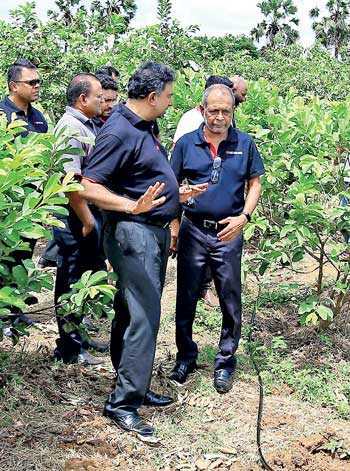 Accordingly, the first stage of this innovative Drip Irrigation System project was launched in Ipalogma on 21 September in the presence of Pan Asia Bank Director/Chief Executive Officer Nimal Thilakaratne, Deputy General Manager Naleen Edirisinghe and other senior management officials. The bank provided financing for this irrigation project under ‘Govi Navoda’ Loan Scheme recently launched by the Government as part of its ‘Enterprises Sri Lanka’ initiative offering loans at interest rates as low as 3.375%.“Our aim through this project is to empower the farming community to prosper by introducing them to the latest technology and enabling them to contribute to the country’s development. 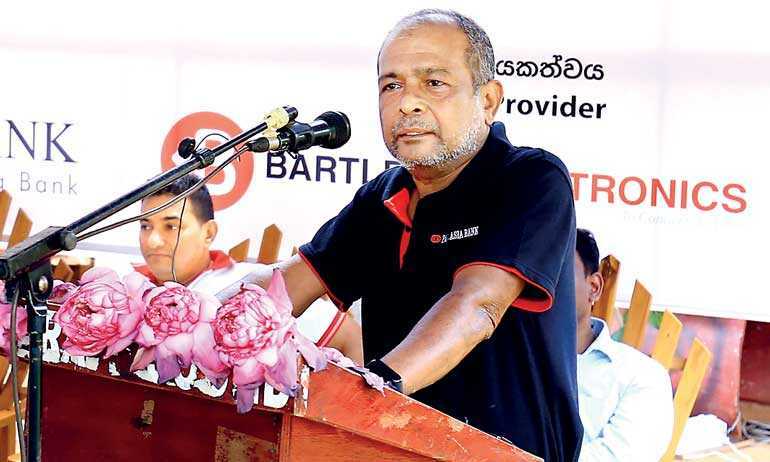 We believe that with the commitment they already have, if we can help them embrace the new agricultural techniques, it would substantially strengthen their economy and living standards,” said Pan Asia Bank Director Nimal Tillekeratne, addressing the gathering at the launch ceremony. Coordination for this project was done by Sujith Dissanayake of the Micro Loans Division, Pan Asia Bank Kekirawa under the guidance of Ranjith Athukorala, Head of Development Loans and Naleen Edirisinghe – DGM Branch Credit of Pan Asia Bank.